Tommy Mungatopi was a well-known early Tiwi artist. The aim of this article is to assist readers in identifying if a Tiwi Bark Painting is by Tommy Mungatopi by comparing examples of his work. If you have a Tommy Mungatopi bark painting to sell please contact me. If you want to know what your Mungatopi painting is worth to me please feel free to send me a Jpeg. I would love to see it. Unlike most Tiwi artists Tommy Mungatopi is better known for his bark paintings than his burial poles or figures. Many of his bark paintings are the same designs as those used on the skins of initiates. This makes his paintings very collectible. He did carve Burial poles and these are also very collectible. Many of Tommy’s most sort after barks have concentric designs either circle’s ovals or squares. Tommy Mungatopi works are similar in many respects to those of his relative Ali Mungatopi. Deaf Tommy Mungatopi was often indigenously commissioned to paint Tutuni poles. 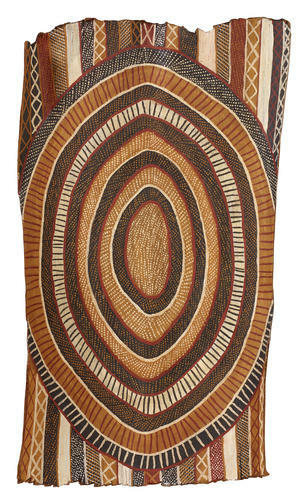 He was recognized as one of the best tiwi painters both for his perfection and his inventiveness. On bark, his most collectable pieces are squashed ovoid webbed patterns. You can tell Deaf Tommy work if you look carefully because he used a Pwoja comb to apply dots. This results in rows of around ten dots at a time to be perfectly aligned. He often painted on a black or white background which results in a real pop of color. Tommy Mungatopi was born around 1920 and died in 1985. Deaf Tommy became deaf from an exploding bomb. As a young man, he worked as a Coast Watcher on Melville Island during World War Two. In the 1950’s during religious conversion, artistic and ceremonial pursuits were not encouraged. In the early 1970’s though there was a steady interest by early anthropologists and collectors. During the 1970s when the Tiwi gained more control of their own affairs art expanded. Appreciation of Aboriginal Art and the deep traditions that lay behind it began increasing. Tiwi Art picked up a contemporary momentum and this, in turn, helped reaffirm Tiwi culture and identity. Deaf Tommy lived at Milikapiti and worked at the Jilamara Art Centre, which is highly esteemed for preserving Tiwi history. In the museum attached to the art center his works (and war medals) are still displayed. Todays best known painters and carvers on Melville and Bathurst islands still seek guidance and inspiration at Jilamara. He was not a prolific artist and most of his works collected by non-commercial collectors such as anthropologists. Deaf Tommy was one of several brothers who were all early Tiwi Artists. His brothers include Lame Toby, King Larry, Alie Miller and one eye Laurie.